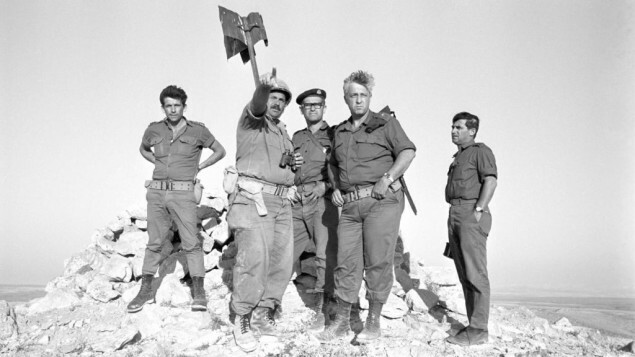 [June 2017 marks the 50th anniversary of the Six-Day War (June 5-10, 1967) between Israel and the surrounding Arab countries. With Israel’s miraculous victory in defense of its homeland, the war was a pivotal event in the history of the Middle East and of the Jewish people. Many of the issues featured in the news today trace their beginnings to the Six Day War—the “two state solution”]. Fifty years after the Six-Day War in 1967, Israel’s military archives have released a partial soundtrack — the IAF’s (Israel Air Force) realtime communications — of the opening, decisive airstrikes in which the Israeli air force destroyed over 400 Egyptian and Syrian planes on the ground, and put 20 Arab airfields out of action. Almost the entire Israeli air force was involved, with just 12 Mirage jets kept back to protect the country. 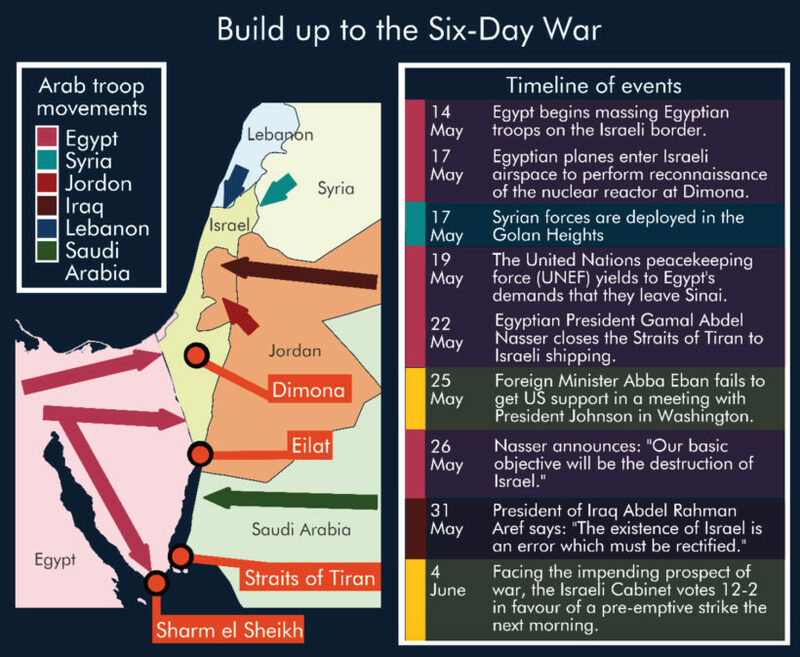 Operation Focus began at 7.45 on the morning of June 5, 1967; by noon that same day, the Egyptian, Syrian and Jordanian air forces had been destroyed, the IAF had almost complete control of the skies in Israel’s pre-emptive resort to force, and the war was essentially won. The operation is regarded as one of the most successful air strikes in military history. In all, Israel lost 24 pilots in the war, seven were injured and 11 were taken captive. In the Hebrew recordings, made public by the IDF archive, the IAF’s command and control officers are heard overseeing a series of critical developments in those opening hours. One recording begins with complete air silence as the pilots head to their first targets, flying low to evade enemy radar, in the first wave of attacks on the Egyptian air fields. The silence is broken by reports of the initial successful attacks: Eleven Egyptian air fields are targeted in these first strikes, and 101 minutes and 183 bombing runs later, some 200 planes, half of the Egyptian air force, is destroyed on the ground. Another recording focuses on pilot Danny Manor, who has been hit by a missile fired by an Egyptian fighter jet during a strike on the Abu Suweir airfield between Cairo and Ismailia. The command and control officers attempt to establish whether Manor managed to eject, and where he may have gone down. Manor survived, was taken prisoner, and was released weeks after the war in a prisoner exchange. A third recording details the fatal shooting down of pilot Yoram Harpaz over Dimona in southern Israel, after he was misidentified as an enemy intruder — apparently because he had lost his communications systems when his plane struck electricity cables during an air strike in Jordanian territory. Mordechai Lavon bailed out of his fighter jet after it was hit and damaged by an ejecting Egyptian pilot during another strike whose soundtrack was released. Lavon fell into the sea off Gaza, and the recordings feature the search for him and the news that he has been picked up by a UN vessel. He was brought back to Israel days later, via the offices of the International Red Cross. Nine years later, Lavon was killed during active reserve service. Reprinted here for educational purposes only, from The Times of Israel. May not be reproduced on other websites without permission. 3. a) Israel destroyed most of the air forces of which three countries at the start of the Six-Day War? b) What was the population of Israel and each of the three Arab countries in 1967? 4. a) How many Egyptian planes and airfields were destroyed in the first wave of attacks in Operation Focus? b) How many Egyptian and Syrian planes on the ground were destroyed by the Israeli air force (IAF) in total? How many Arab airfields were put out of commission? 5. What do you think of the IAF’s decision to release some of authentic text – the actual realtime communication – from the day of Operation Focus? 6. Watch the videos under “Resources” and check out some of the links to info on the Six-Day War. What surprises you the most about Israel’s victory? 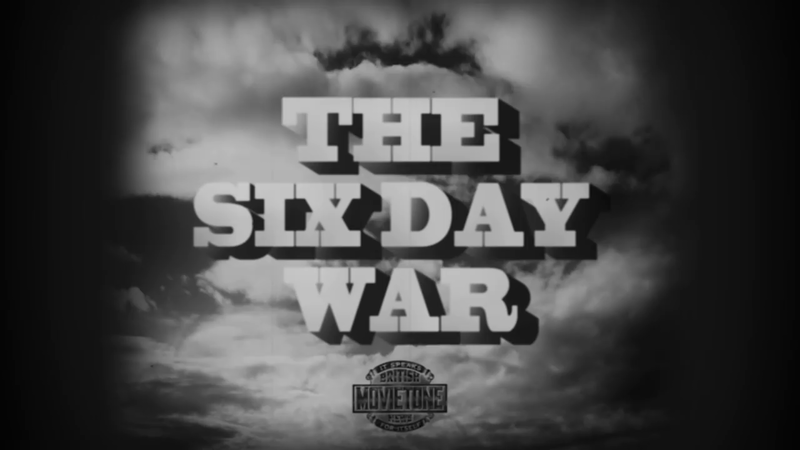 The Jewish Leadership Council has created Twitter and Facebook pages “SixDayWar: 50YearsOn” to post the news as it happened on that day in 1967 – starting May 15. Six Day War Project with videos. The Temple Mount in Jerusalem is the holiest site in Judaism. 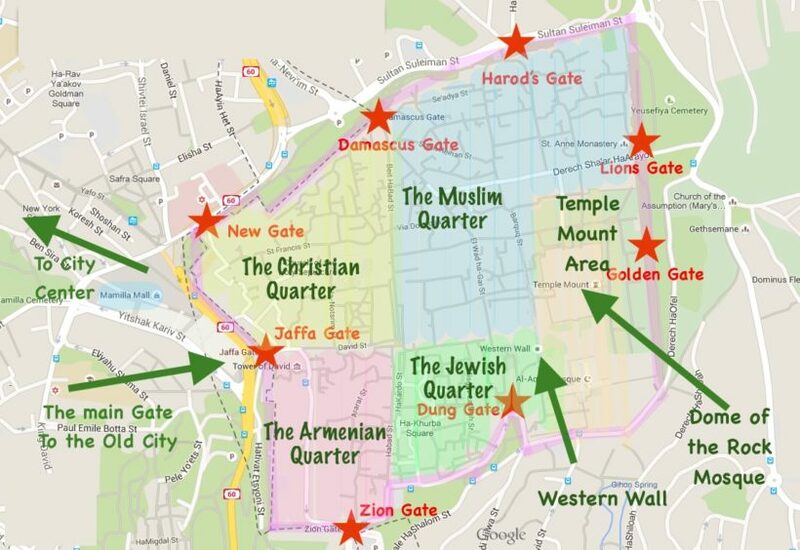 It is the location of the First Temple and then the Second Temple. The site also housed the Holy of Holies, where the Ark of the Covenant stood as the earthly home for the divine presence. The Temple Mount is considered the third-holiest site in Islam, after Mecca and Medina in Saudi Arabia. It houses the Dome of the Rock shrine and Al-Aqsa mosque. The Temple Mount is also holy to Christians. It houses the Church of the Holy Sepulcher.